Pierce County is home to thousands of jobs in the global aerospace industry. To ensure the State of Washington remains a leader in aerospace it is vitally important we work together to innovate along with Boeing, Toray Composite Materials America, Inc., AIM Aerospace, Tool Gauge and hundreds of other companies. An important way to do that is to participate in the 13th annual Aerospace Futures Alliance Governor’s Aerospace Summit Oct. 10. This year’s theme is Being Bold in the Age of Innovation. There’s still time to get in on one of the most anticipated aerospace events of the year. The daylong event at the Lynnwood Convention Center will feature presentations, fireside chats and in-depth analyses. Hear from top executives in the aerospace industry with unique and insider views of the trends and developments that are changing the industry today and into the future. 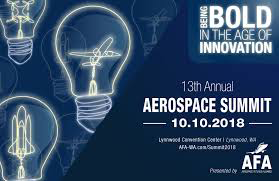 Winners of the AFA Aerospace Awards for aerospace company of the year, executive of the year and emerging leader will also be announced during the summit. The annual event comes on the heels of the merger of the AFA and the w. This dynamic collaboration marks a significant milestone for the space sector in Washington State, and will help to strengthen, support and advance the industry across the state. More information is available on the AFA website.